Originally set into a wall of Priory School, on Rugby Road, but is currently (July 2012) missing, presumed stolen. 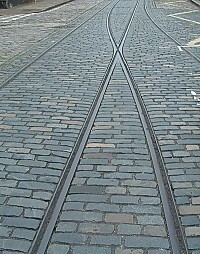 In this road is one of three preserved sections of exposed tram track in the city. This example shows the unusual semi-crossovers used to keep trams in the middle of the road without the need for points. Trams first ran on the track on the 26th August 1901. Its use ceased at the end of 1931. Work on restoring the road surface was carried out in 1987-88 on behalf of Hampshire County Council by Portsmouth City Council as part of the Urban Regeneration Programme. 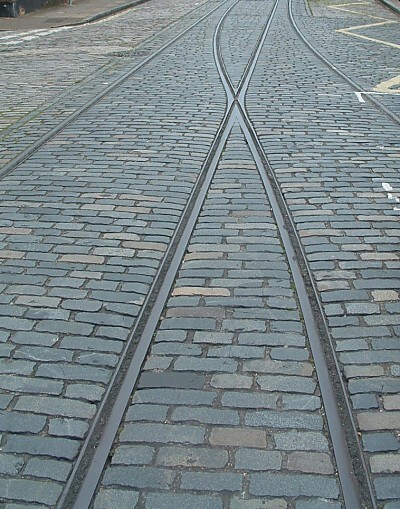 The other two preserved sections of tram track are on Old Commercial Road, in front of Charles Dickens's birthplace and on Broad Street, Old Portsmouth, near Point.